My old friend Richie Dixon (many years ago he was 2 years behind me as a student at the Scottish School of PE, Jordanhill, Glasgow) is a very well-respected coach and adviser in the country of Georgia. Last year Richie was awarded the country’s Honorary Order of Excellence by the President of Georgia Mikheil Saakashvili for his part in the performance of Georgia in the World Cup Rugby in September 2011. This proud small sovereign state, with a population of 4.469.000 in the Caucacasus region of Eurasia, shares its borders with Russia, Turkey, Armenia and with Azerbaijan. Georgia has now been independent since 1991. After a long period of internal of conflict, the Rose revolution of 2003 brought about new democratic and economic reforms. The country has experienced centuries of conflict – and indeed relatively recently went through the Russo-Georgian war over the two regions of Abkhasia and South Ossetia. Since the IRB World Cup, Richie has continued to serve Georgian Rugby as an adviser. Richie’s reputation had resulted in him being invited to contribute to the thinking about sport development – in general – for the country of Georgia. The 2012 Georgian elections – resulted in a new administration, a new Prime Minister and new Ministers. A working group was established to take forward Sport Policy. I was invited to join the working group for three days in December 2012. I had only been invited to Georgia about two weeks earlier, I knew so little about Georgia, so it was with trepidation that I set off on the ten-hour journey from Edinburgh, Scotland. I learned some things very quickly. It is a 5 hour flight from Heathrow to Tbilisi, and you generally arrive at 4am. Richie, so typically, was there to greet me at the airport , despite the hour! The weather was quite a bit warmer than in Edinburgh – and I learned of course that Georgia has very warm climate that helps the country to grow so much food and produce so much wine. Although I spent the entire period of time in Tblisi – I could see from the plane as I left the fantastic mountains, and the Black Sea Resorts towns. Will tourism become a very big industry in Georgia? I learned at least some of the customs and the spirit of real hospitality – enjoying two Supras (Georgian banquets with the table groaning with food) and all kinds of toasts – starting with those related to the families of those around the table. I also saw a real powerful symbol for Georgian people – a 20m statue Mother Georgia , visible from all over the city. She has a sword in one hand, and a bowl in the other. Showing Georgia as hospitable but ready to defend herself. Over the first three days of my visit, I was honoured to have meetings with the Georgian Ministry of Sport and Youth Affairs Sports Development working group which included the Sports Minster Levan Kipiani, Deputy Minister Tamaz Tevzadze and the Director of Sports Development Irakli Dolaberidze. We met with many people, and in particular former staff members and students of the former State University of Sport. There appears to be a real desire and commitment to reestablish a Georgian University of Sport and Physical Education. It was such a privilege to listen to so many really committed people, passionate about their country, its traditions in sport and its future. All this despite the many difficulties and brutal memories. At one particular meeting, a packed room of more than eighty people sat, many in tears, to hear that the new Georgian Government has decided to set up a new Georgian University for Sport and Physical Education. The former University will have its facilities renovated, and the initial focus will be to set up Physical Education courses at the University. I drafted a paper before I left with some thoughts for the working Group to consider. One of these is to faciltiate a short study tour of the Working Group to some European Sports Universities. The Georgains, I think are particularly keen to visit some of the UK Universities. Not least, I think, because the second language of Georgia is now officially English! I am hoping that the the British Embassy will also get involved in supporting the developments. I was so pleased to meet Doug McMillan, Deputy Head of Mission in the British Embassy in Tbilisi. He was so informed and so positive about Georgia. And Doug is a young Scot from Haddington, only 15 miles from Edinburgh! 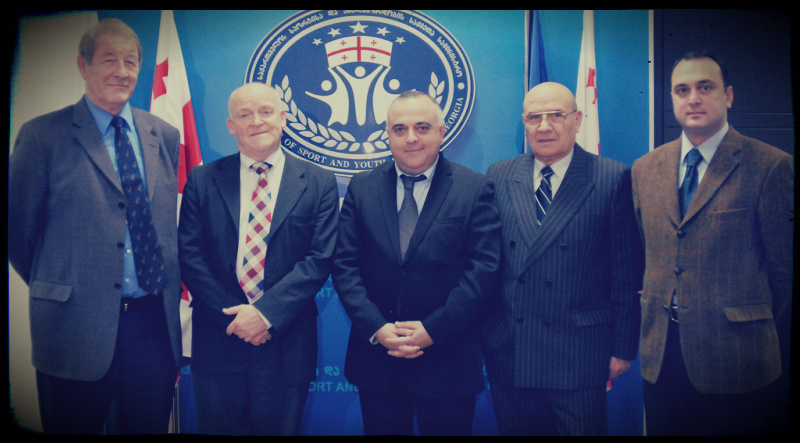 We met two colleagues from the Georgian School Sport Federation. They shared some of their recent work of staff development for teaching PE in the elementary schools. Two booklets had been developed with support from UNICEF to assist the teachers. 180 teachers had undertaken the training to date. The Ministry is keen to develop sport in such a way that is more accessible to more people. Currently a total of not many more than 35000 citizens are participating in all the sports. At the same time there is such a proud tradition is certain sports at elite level, in wrestling, weight lifting, gymnastics, in rugby. So its exciting, but it is very challenging. there is a need to identify some outstanding young leaders for Sport and PE. I was fortunate enough to look around two exhibitions whilst in Tbilisi – The Georgian Sports Museum, and the National Museum that was housing a temporary exhibition graphically depicting the 70 years of Soviet control of Georgia. The Sports Museum demonstrated the rich heritage of Georgian sport, from centuries ago when the Romans and Greeks came to learn about developing physical culture from the Georgians, to the more recent times with successes in weightlifting, rugby and wrestling and interestingly chess! So now I am home in Edinburgh. I cannot stop thinking of Georgia , and its struggles to become a young , Western vibrant nation. I believe that the senior politicians see Sport and Physical Education as one of the tools to self improve the country. I do hope that I can play a small role in helping that development.